Neurological findings on examination are driven by the anatomical level of the anomaly and the severity of brainstem or spinal cord compression. Neurological findings that do not correlate with the level of the lesion should prompt further diagnostic evaluation. Brainstem findings: Evidence of lower cranial neuropathy can include dysphonia (a high-pitched, nasal voice) or dysarthria (soft or whisper-like voice). Occasionally, tongue fasciculations are present with severe, long-standing brainstem compression. Myelopathy: Quadriparesis, hemiparesis, gait difficulty, and hyperreflexia are all hallmarks of spinal cord compression and can be identified on examination. Bladder and bowel abnormalities: Although rare to find on examination, sphincter dysfunction can lead to loss of bowel and bladder control. Routine: No routine laboratory abnormalities are expected. The foundation of radiographic evaluation of cervical spine anomalies is good quality, plain x-rays, which are mandatory for each patient. Complex craniovertebral anatomy can sometimes be difficult to see and often requires further imaging such as CT.
Flexion, extension films: As part of the plain radiographs, cervical spine flexion/extension views are also commonly acquired and serve as a test to detect or document spinal stability. 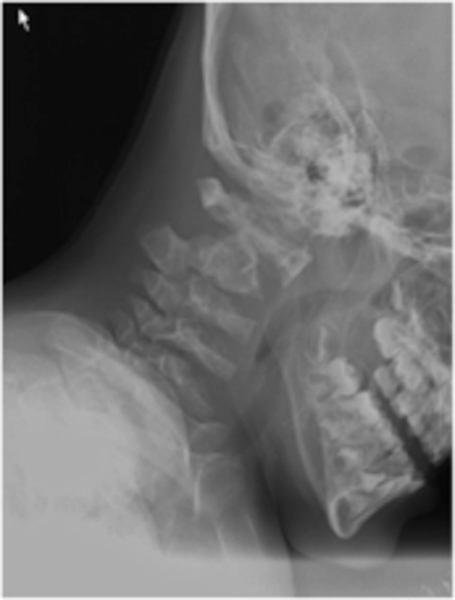 Morquio syndrome, extension x-ray: Normal craniocervical alignment is present. 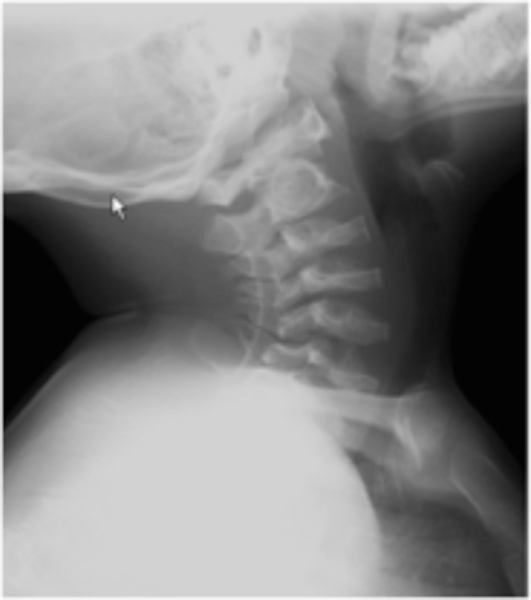 Morquio syndrome, flexion x-ray: Severe atlantoaxial subluxation is demonstrated. Thin-cut axial images occiput to T1: Thin-cut CT images from the occiput to T1 with two-dimensional reconstructions in the sagittal and coronal planes are mandatory in the evaluation of cervical spinal anomalies. All abnormalities must be accounted for, from the occiput to the thoracic spine. 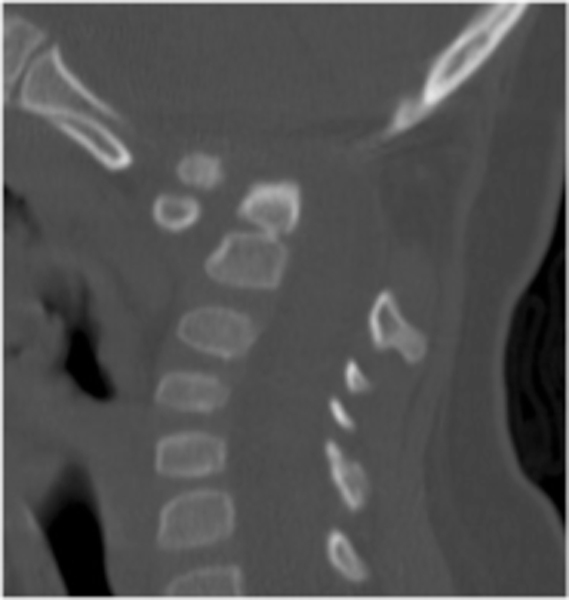 Sagittal CT of os odontoideum: A complex os odontoideum/C1 abnormality is seen, resulting in severe craniocervical kyphosis. T1- and T2-weighted, axial, coronal, and sagittal images: MRI complements the CT images and should be obtained in the axial, sagittal, and coronal planes. T1- and T2-weighted images are usually sufficient to detect spinal cord impingement or injury. Occasionally, if a syrinx is seen and a tumor is suspected, gadolinium administration is indicated. 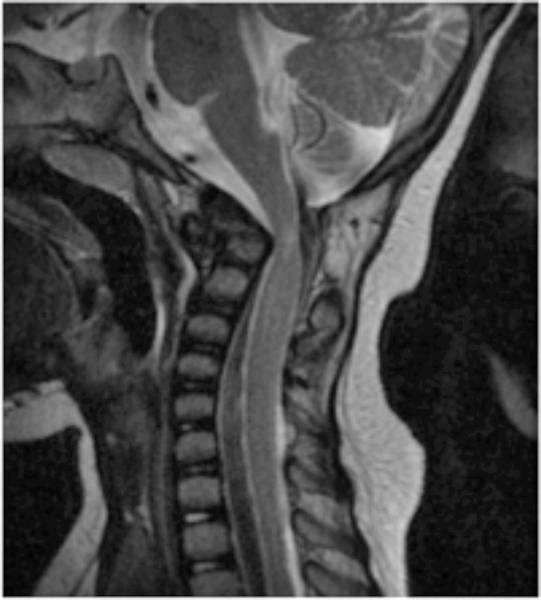 Sagittal MRI of os odontoideum: The upper cervical spinal canal is severely narrowed due to craniocervical kyphosis. Not indicated: Nuclear medicine tests are not indicated for congenital cervical anomalies. Evaluate radiculopathy: Generally, preoperative electrodiagnostic tests are not indicated for congenital cervical anomalies unless there is a question regarding the function of a specific nerve. Subjective or objective signs of myelopathy are usually sufficient to help make decisions about operative management. Not indicated: Neuropsychological tests are not generally indicated for congenital cervical anomalies. Agreement of imaging studies: All radiographic findings from various modalities must agree with one another. Decisions about anatomical suitability for hardware placement must be made after careful review of the films. Surgical planning using imaging: Preoperative planning is essential before taking the patient to the operating room is contemplated.